Used primarily as production finishing tools. 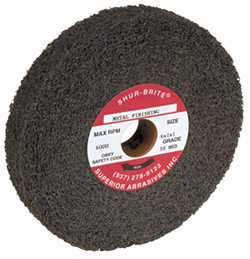 Metal finishing wheels are for general purpose cleaning and finishing on ferrous and non-ferrous metals. Not intended for deburring or use on sharp edges. Applications include a wide range of satin finishing, rust and thin paint removal, and restoring stainless steel after weld removal to a clean, grain-like satin finish.